In the late 70s and 80s, Americans were led to believe that “fat makes you fat,” and suddenly, nearly every household pantry item was available fat-free. Since then, Americans have decreased fat consumption in their diet from 47% to 34%, but we have also become increasingly overweight and unhealthy. So why are we getting bigger and not better? When manufacturers began creating fat-free versions of their food products, a common problem arose: a lack of taste. To make up for the flavor deficit, sugar content was dramatically increased. The pharmaceutical and food industry make 4 billion dollars a year in low-fat marketed products alone, but there is no scientific evidence to prove that “fat makes you fat.” There is, however, evidence that proves why society is getting fatter and fatter, and the reason is sugar. My goal is to educate others about how harmful sugar can be to your body. Replacing fat with sugar was one of the most detrimental acts the food industry committed. If we have a better understanding of the effects of sugar on our bodies, though, then we can make better choices when grocery shopping and meal planning. Let’s start with the basics. There are four basic sugars: glucose, lactose, fructose, and sucrose (simple carbohydrates). Glucose is your body’s primary energy source. It is found naturally in fruits and vegetables. Lactose is the sugar that is found in milk products. Sucrose is your common table sugar. Its chemical compound is one molecule of fructose and one molecule of glucose. Starches are your complex carbohydrates. This is what plants use to store energy (glucose) and its chemical composition is a chain of glucose molecules strung together. You will find these types of sugars most commonly in wheat, rice, corn and potatoes. This includes bread, pasta, corn chips, pastries, etc. Glucose – This is the easiest sugar for your body to use because it goes straight your stomach, then small intestine, then is carried through the bloodstream to cells around your body for energy. Any excess glucose that was not used for energy is stored as fat. Glucose is the easiest for your body to use because it doesn’t need to change its chemical compound. 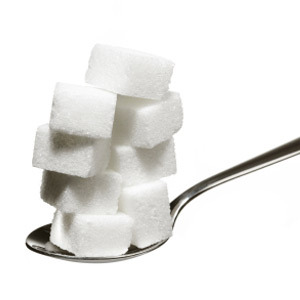 Fructose – This type of sugar CANNOT be used immediately. It undergoes chemical changes in the liver then gets absorbed into the bloodstream. Because it needs to be broken down in the liver, it has a slower metabolic pathway which means it takes longer to convert to energy. Lactose – When you are born, your body normally produces an enzyme, lactase, that breaks down the lactose molecule into glucose so the body can digest it. Our bodies are genetically programmed to stop producing lactase at an early age. Some people stop producing the enzyme altogether. We are only able to drink milk after infancy because we’ve tricked our bodies into believing we are still nursing, so the lactase enzymes keep working. Without lactase, the lactose will turn into fat. Sucrose – Since sucrose is made up of one molecule fructose and one molecule of glucose, it needs to go to the small intestine to separate the sugars. Glucose is immediately usable and fructose is sent to the liver for processing. Starches – Starches travel to the small intestine, and the glucose chain is broken down and absorbed into the blood. The metabolic pathway is a little longer but still quickly absorbed into the bloodstream. Starches are known for spiking blood-sugar because of this. The truth about artificial sweeteners is that although they may save you calories, they still stimulate high-insulin levels in blood. Again, high insulin levels in blood will promote storage of body fat. Some of the harmful side effects of artificial sweeteners include weight gain, toxicity to your liver and kidneys, gastrointestinal problems, and increased risk of cancer. At the end of the day, you should know that a low-fat diet is a misconception that has been disproven by nutrition experts. What experts can agree on though, is that sugar, especially in excess, is unhealthy. One of the best modifications you can make to your diet right away is to eliminate sugar as much as possible. For many people, sugar (mainly from processed foods and starchy carbs) is a major energy source for their body. This energy source, however, can be detrimental to your health. Eliminating sugar from your diet may have you fatigued for the first couple of weeks as your body adjusts to using healthy carbohydrates (like vegetables and some fruit) or burning fat for energy instead. It takes around 10-14 days for this adjustment to complete. Then you’ll begin seeing RESULTS! So, whether your goal is to lose weight, tone-up, or simply live a healthier lifestyle, cutting sweeteners is key to your success!